T. C. During the construction of the PRESIDENTIAL PALACE PAL..
Production Starts in New Mine! Production of Diabase stones, which are produced from the quarries belonging to our company, have .. 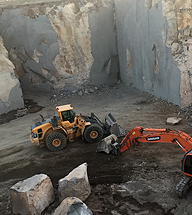 Founded in Kayseri with Basalt, Andezit and Ottoman Green products with the latest technology of the sector and always following the innovations and investing for the last years, it will serve its customers with a wide range of products by processing the blocks they have obtained from their own quarries in the modern and new factory.